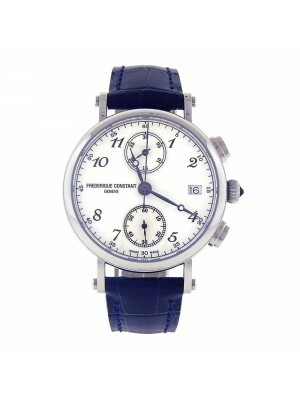 The Frederique Constant brand is a well-known Swiss watch brand manufacturing watches of high-end quality. The history of this brand started in 1988 when Peter Stas with his wife Aletta Stas-Bax took a decision to establish the watchmaking company. The brand’s name itself consists of two names: Frederique Schreiner and Constant Stas. Both of them are great grandparents of Peter and Aletta. Moreover, Constant Stas was involved with the watchmaking industry. He founded his own company manufacturing printed clock dials for different models of watches in 1904. Peter Stas, his great-great-grandson, decided to preserve original traditions of manufacturing for Swiss-made watches and opened this own company. Moreover, the Frederique Constant brand is an affiliated company of the Citizen brand, a Japanese company known all over the world. Nowadays, Frederique Constant a wide range of timepieces for men and women for every occasion. The assortment of this company is represented by 8 collections: “Classics,” “Slimline,” “Vintage Rally,” “Runabout,” “Horological Smartwatch,” “Delight Automatic,” “Ladies Automatic,” and “Manufacture.” All these collections have fascinating watches for men and women. The main peculiarity of each timepiece by Frederique Constant is not only famous Swiss quality but also an attractive design expressing elegance and simplicity. 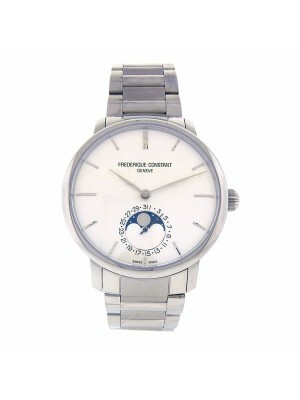 However, pre-owned Frederique Constant watches are in favor as well. For example, one of the most famous models of the past was the “Vintage Rally” timepiece for men. This fascinating watch has a 44mm stainless-steel case with a strap of simple black leather. Its silver dial has some peculiarities: it is manufactured in two colors – white basic color and three black sub-dials of the chronograph at 3, 6, and 9 o’clock. All hands and hour markers are made of silver as well. This timepiece has an automatic movement and increased water resistance up to 100 meters. The slogan of the Frederique Constant company sounds as follows, “Let more people enjoy luxury.” This means that the brand is working to widen the group of people who want to have timepieces of high-end quality at affordable prices. Therefore, the main gimmick of this company is not only the best clock mechanisms but fascinating designs as well. All women have an excellent opportunity to appreciate the appearance of female watches by Frederique Constant. One of the best samples of watchmaking art by Frederique Constant is the “Heart Beat” model. The first version of this model was launched in 1994 and had a great success among clients. Nowadays, “Heart Beat” is still the hit of this company. This fascinating watch has a 34mm stainless-steel case encrusted with small diamonds around the bezel. Its convex sapphire glass guarantees water resistance up to 6 Atmospheres (or 60 meters). A silver dial has mother-of-pearl coating, specific guilloche ornament in the center, silver indexes, and incrustation with 8 diamonds. The zest of this model is the exhibition case back giving the opportunity to observe the work of 26-jewels clock mechanism with an automatic movement. Such a beautiful timepiece for ladies gives an exclusive chance to see how time is running out in the truest sense of this word.